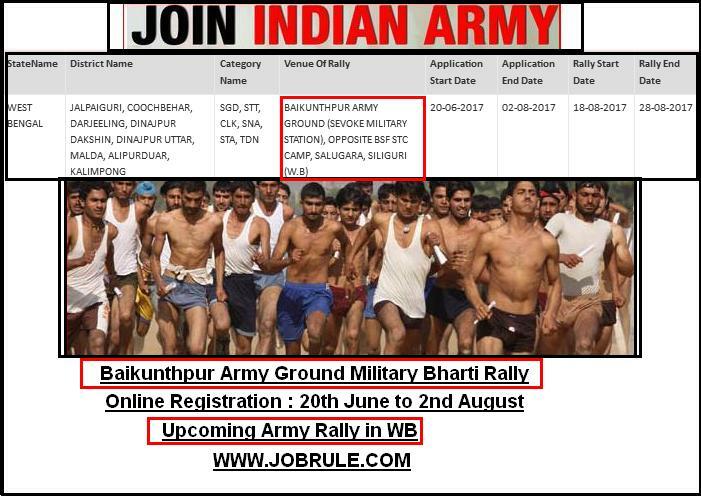 Army Recruitment Office (ARO), Siliguri (Under HQ RTG Zone Kolkata) going to conduct a direct/open Army Recruitment Rally on 18th-28th June 2017 at Baikunthpur Army Ground (Sevoke Military Station) Opposite BSF STC Camp, Salugara, Siliguri (West Bengal) to recruits thousands Indian Army Soldier General Duty (GD), Tradesman, Technicians, Clerk/Store Keeper etc trades. Interested candidates from the district of Jalpaiguri, Coochbehar, Darjeeling, Dinajpur Dakshin, Dinajpur Uttar, Malda, Alipurduar and Kalimpong of West Bengal State may apply online between 20th June to 2nd August 2017 to attend Physical Fitness test (PFT) & Physical Efficiency Test (PET) for Upcoming/Next Siliguri Baikunthpur Army Rally 2017. North Bengal St. Xavier’s College, Jalpaiguri, One of the best degree college under North Bengal University, Siliguri, invites Online Registration form for admission to 1st Year Under Graduate B.A/ B.Sc/ B.Com Honours/General courses for 2016-2017 academic session. To check more details about North Bengal St. Xavier’s College Online Admission , Counseling schedule dates, Subject wise in-take seat capacity & St. Xavier’s College Merit List 2016, simply go through below given direct link (s). Maynaguri College, Jalpaiguri district, affiliated to North Bengal University, going to publish 1st Year Under Graduate B.A/ B.Sc Honours/General courses Online Admission 2016-2017 session Provisional Merit List on 9th June 2016. To check Maynaguri College Subject & Category wise admission E-Counseling schedule, Maynaguri College Provisiona/ Final Merit List 2016, simply follow below given direct link. Prasanna Deb Women’s College (popularly known as P.D Women’s College) ,one of the best Girls’ College in Jalpaiguri district, affiliated to Uttar Banga University, Siliguri, going to publish 1st Year Under Graduate Honours/ General courses Online Admission 2016-2017 academic session Provisional Merit List on 9th June 2016. To check Jalpaiguri Prasanna Dev Women’s College Admission & Counseling related information, date sheet, Jalpaiguri P.D Women’s College Merit List & other information ,simply go through below given direct link. 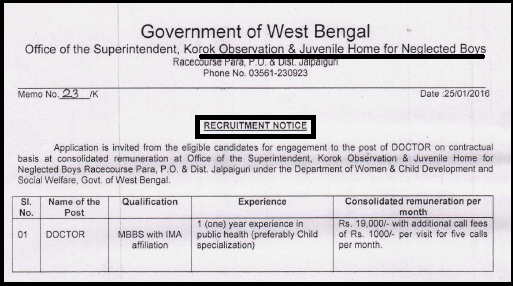 Office of the Superintendent ,Korok Observation & Juvenile Home for Neglected Boys, Jalpaiguri District ,Government of West Bengal, invites Application in prescribed application form for recruitment to the post of “Doctor” on contractual basis under the Department of Women & Child Development & Social Welfare with fixed Rs.19000 monthly salary with additional call fees of Rs.1000 per visit for five calls per month. 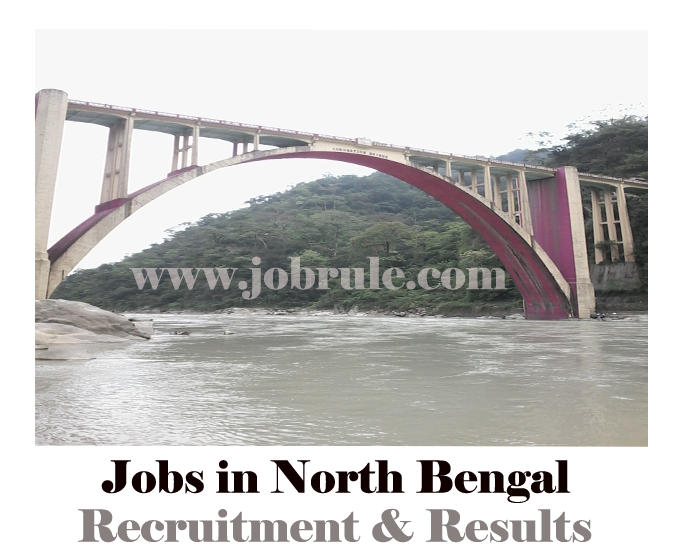 Water Resources Investigation and Development Department, Office of the Executive Engineer- Agri Mechanical (Jalpaiguri Division), invites application in prescribed format for recruitment to the post of 5 nos Sub Assistant Engineers (Junior Engineer) for Agri Mechanical Wing Under WBADMI Project Jalpaiguri & Darjeeling on purely temporary/Contract basis. Diploma in Mechanical Engineering from any recognized institution . One year experience in government project work with knowledge in CADD and MS office package. The selection procedure will be based on written examination followed by personal interview. The written test will be held at the campus of the Jalpaiguri polytechnic Institute, Jalpaiguri, on 27.07.2014 (Sunday) .